We have lively connections with a broad range of cognate disciplines including Classical and Ancient History, Scottish and Medieval History, Celtic, Geography and Earth Sciences, and Chemistry. We have strong links with the University’s Hunterian Museum, and the Scottish Universities Environmental Research Centre. The Archaeology Department consists of 14 academic staff, with three post-doctoral research fellows, three administrative support staff, and two technical staff. We work across 2.5 floors of the Gregory Building which provides a wide range of teaching and research facilities. A suite of laboratories with integrated teaching and research facilities including a microscope room, a thin-sectioning lab, and an environmental lab, support archaeological and environmental materials processing. Research postgraduates enjoy their own computer-equipped workroom and all students have 24-hour access to a dedicated IT lab. Home to the Centre for Battlefield and Conflict Archaeology, an exciting and relatively new discipline. Glasgow also has particular expertise in Scottish and Mediterranean archaeology, as well as specialising in computer applications,landscape archaeology, and material culture studies. 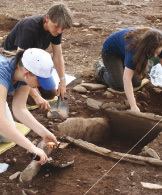 There is also a major field school programme for students based around Forteviot, Perthshire. The leading archaeology department in Scotland, and came fourth in the most recent (2012) Guardian league table of UK archaeology departments. At Honours level, Archaeology can be taken as a Single Honours or Joint Honours degree. Glasgow offers one of the widest ranges of Joint Honours programmes in the UK. I used that book to undertaken numerous excavations in Scotland from the 1960s to the 1980s but cannot find my own copy now. It doesn’t seem to exist in the Univsersity Library. I want to consult it again to explain methods in a new book for Archaeopress.